Blackberries are one of my favorite fruits. I love them not only for their plump glistening black purple color, or sweet juicy flavor, but because they ripen at the height of summer, making them the perfect symbol of the season. This year is the first my Apache blackberry has a floricane. I planted it in 2008. The first year it grew a primocane from which the secondary floricane grew off of this year. 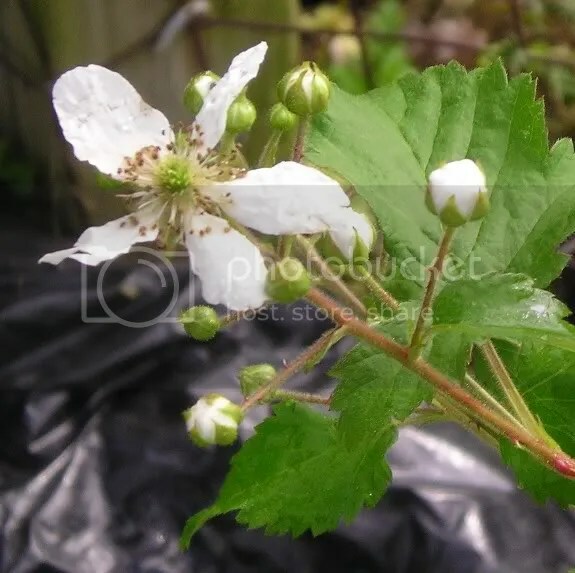 At this time year, during flowering, the blackberry’s origin in the family Rosaceae is very obvious. From the thorns, to the compound leaves, and especially the delicate five-petal flowers look a lot like tiny roses. Apples and strawberriers are both Rosaceae as well, especially evidenced by the flowers. Apache is an erect blackberry cultivar, one of a series developed by the University of Arkansas. They apparently used a theme naming convention, with the other cultivars all named after different Indian tribes, including Cherokee, Arapaho, Navajo, and others. Perhaps they chose Indian names because the Blackberry is native to the Northern Hemisphere? I planted this blackberry root stock before finding out about a 100 foot section of fence covered with wild blackberry bushes in one of the far away pastures. Although there is an almost endless supply of wild blackberries I am still pulling for my little potted blackberry to produce a bountiful crop. I’m not sure if the wild ones are blackberries or black raspberries. 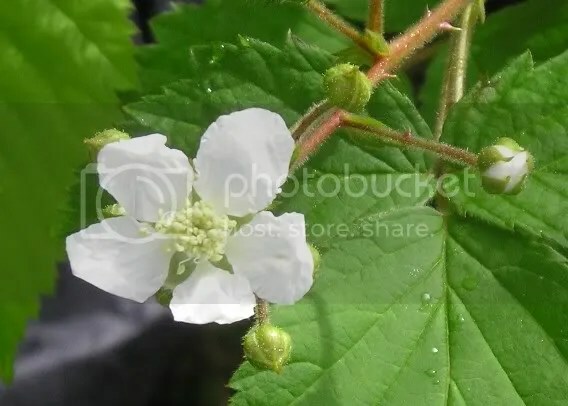 You can tell blackberries and raspberries apart by looking at the stem connection. If there is a hollow center it is a raspberry. If you can see where the woody stem attached it is a blackberry. I’m excited! As I type, berries all over are swelling behind the remains of pollinated flowers, waiting to be harvested by hungry passers by. To learn more about Blackberry and Raspberry culture check out this entry from the University of Georgia.